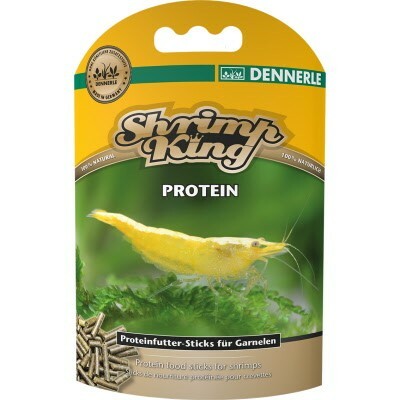 For targeting dietary supplementation with the finest quality proteins and important amino acids, give your shrimp Dennerle Shrimp King Protein Food Sticks. These sinking, water-stable sticks have significantly higher protein content compared with our main food at 42.2%. Incorporate it in your regular feeding for variety and as a dietary supplement. Breeding shrimp in particular will benefit from Shrimp King Protein. Shrimp species that naturally require more protein can also feed appropriately. The proteins and key amino acids are sourced mainly from aquatic lifeforms (Gammarus, Daphnia, decapsulated Artemia cysts, shrimps, green-lipped mussel). The outcome is prime nutritional composition and bioavailability. Guarantee: No artificial colors or preservatives, and free of fish meal. Tip: Shrimp King Protein is also exceptional food for other species throughout breeding and egg-laying, such as crawdads, dwarf crawfish (CPOs), crabs, long-arm shrimp, and snails.